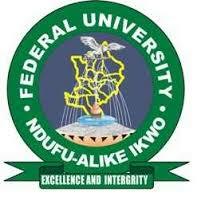 Federal University Ndufu-Alike, Ikwo (FUNAI) Post-UTME Supplementary Admission Screening Form, Eligibility, Cutoff Mark, Screening Requirements, Date and Time, Application Guidelines for 2018/2019 Academic Session. This is to inform the general public, especially candidates that sat for the 2018 Unified Tertiary Matriculation Examination (UTME) that registration for the on-going supplementary admission into the University has been extended to 12 noon, Wednesday, 10th October, 2018. Deadline for submission of applications: All applications should be submitted in the Office of the AE-FUNAI Public Relations Officer (PRO), 3rd floor, Administrative block, permanent site on or before 12 noon, Wednesday, 10th October, 2018.